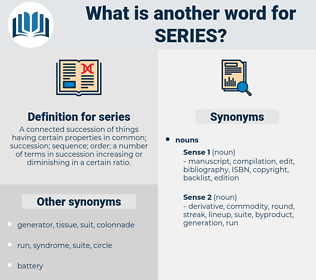 What is another word for series? 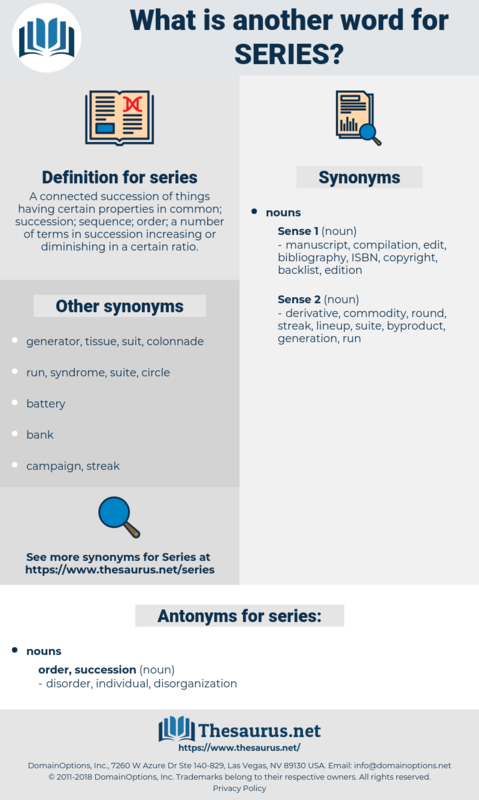 A connected succession of things having certain properties in common; succession; sequence; order; a number of terms in succession increasing or diminishing in a certain ratio. agreements, structures, presentations, articles, conclusions, reviews, sources, NS, suite, suites, instalment, sequence. episodes, instalments, segments, sequences, transmissions, courses, videos, Exercises, editions, Generations, pictures, ranges, estimates, groupings, requirements, streams, clusters, Stories, portfolios, affiliates, pairs, packages, Inventories, Standards, Subsidiaries, stages, Categories, rules, arrangements, assessments, processes, MOVIES, offerings, barriers, Phases, Firms, repertories, Quantities, editors, Surveys, items, Classes, participants, cycles, proposals, Families, periods, rows, waves, examples, applications, departments, holdings, changes, types, kits, objectives, wheels, notes, packets, packs, batches, bins, kinds, workers, trains, data, sorts, options, Forms, units, Bodies, covers, launches, blocks, Tracks, LINEs, members, guys, reviews, suites. data, Las, covers, variety, raft, spate, multitude, assortment, ream, plethora, suite, instalment, Dramas, successive, continuum, spree, litany, spectrum, portfolio, sequence, batch, catalogue. I said a 'definite series of events. Indeed, knowledge itself is action, a series of actions. scorsese, series', sorus, sucrose, ski rack, squirearchy, syracuse, Skagerak, sorgo, sciurus, shirk, susurrus, seagrass, screak, shrike, ceres, scherzo, skreak, sikorsky, shiraz, siris, seahorse, sarawak, scourge, shag rug, screechy, scrooge, sayers, shears, scissors, SARS, sargasso, sirius, search, siracusa, screaky, shire horse, shakers, susurrous, surge, saurosuchus, ski race, shrug, sucrase, squaw grass, scours, serous, seiurus, siriasis, sugar cookie, shrewish, saccharose, saragossa, Sirach, saururus, screech, scheuchzeriaceae, sewer gas, scissors kick, scorch, scrag, sewerage, serge, sewage works, siqueiros, sea horse, sirocco, scores, skew arch, serosa, Sargasso Sea, shark, saccharase, sage grouse, serax, squark, skreigh, sorgho, sericeous, squarish, scraggy, Skagerrak, shriek, surcease, Showy Orchis, sourish, serious, sazerac, sawhorse, screw key, SIRC, saurischia, sea wrack, sack race, scarce, screw jack, source, sorex, secrecy, saururaceae. Fourier Series, convergency, divergency, convergence, geometric series, divergence, power series, exponential series. cycle, line, nexus, progression, course, electromotive series, patterned advance, succession, lanthanide series, wave train, concatenation, rash, electromotive force series, chain, stations of the cross, blizzard, cordon, train, helium group, sequence, hierarchy, electrochemical series, Stations, actinide series, string. grouping, ordering, order, ordination, group.